I am Russ Krajec, executive director of IP.Education. 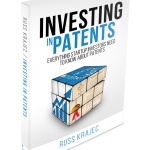 I am a patent attorney, author of “Investing In Patents”, and an investor who finances patents for startup companies. The Ethical Collaboration Agreement grew out of a problem: any patent that came from an accelerator or incubator automatically had its value cut in HALF because of a missing piece in their NDAs. The Ethical Collaboration community grew from that seed into a vast network of entrepreneurs, advisors, mentors, service providers, inventors, investors, and countless other people.